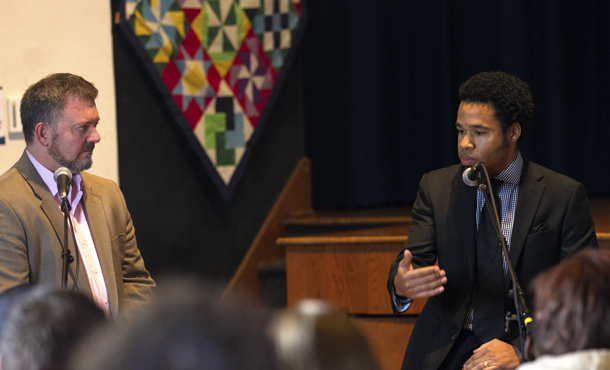 Two Eastern Mennonite University professors – one white and one black – gave back-to-back chapel talks in the past week that highlighted the impact of Dr. Martin Luther King Jr. and his compatriots on the past, present and (they hope) future of their university. Addressing a well-filled Lehman Auditorium on Jan. 17, history professor Mark Metzler Sawin traced EMU’s history from the early 1940s and the first admission of black students, through the 1960s, when visiting black Mennonite activists challenged the white Mennonite community to raise their voices against racial inequality. Both speakers shared a common theme: the dangers of adulation. EMU’s predecessor, Eastern Mennonite College, took its first steps toward desegregation, in defiance of local and state law, in the late 1940s. This change was not without controversy within the Mennonite community: though EMC became the first historically white college in Virginia to reverse its racial policy and accept a black student in 1948, the Virginia Mennonite Conference did not lift its strictures on integrated worship, including shared communion, foot-washing, and the kiss of brotherhood, until 1955. Facing social, financial and academic obstacles (including overt and covert racism), the first six black students did not stay to complete their degrees, based on Sawin’s search of EMC records. Local resident Peggy Webb was urged to head to Hesston College in Kansas for her first two years of college, before EMU belatedly let her enroll in 1950-51 and earn a degree in 1954. Her tenacity was surely influenced by her mother, Roberta Webb, a teacher and member of Broad Street Mennonite Church, who was a strong advocate of racial equality. By the mid-1950s and 1960s, a handful of Mennonites – some from Eastern Mennonite, including Titus W. Bender ’57 – were active in the civil rights movement. (Bender, a professor emeritus who resides in Harrisonburg, spoke during chapel earlier in the week of his experiences as a pastor in the 1960s working on racial reconciliation efforts in Mississippi.) But while Mennonites were strong critics of the Vietnam War, their silence on civil rights eventually prompted King to level criticism. “Where have you Mennonites been?” he asked one church leader. Considered a Communist and an agitator, King was critical of white supremacy, economic exploitation, racial oppression, and worldwide violence. Though he advocated non-violence and passive resistance, King confronted white America with “anger, discontent, and maladjustment”– all qualities that Evans pointed out are removed from today’s popular image of King. The collective memory of our nation has forever linked King to his famous “I Have a Dream” speech delivered in August 1963 at the March on Washington for Jobs and Freedom. Yet the qualities required to be a dreamer, Evans said, are those of the perpetually dissatisfied, what King himself described as the “divine discontent.” These qualities made King a towering force of energy, charisma and inspiration, but they also made him dangerous – and eventually led to his death. To best honor King, Evans said, see him as who he was: as the revolutionary thinker expressing the anger of moral outrage, as a man of normal stature rather than the moral giant, as a culpable human with faults and excesses, and as the perpetual dreamer unsatisfied with the inequities of the world.